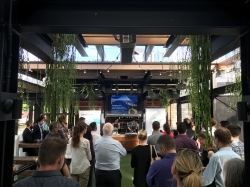 Over 50 water professionals from a range of organisations and disciplines ventured to the picturesque surrounds of South Wharf on February 12 to attend our first Water Drinks for 2018. The evening provided attendees with a fantastic opportunity to learn from our guest speakers on the topics of social research, consultation and community engagement in the Integrated Water Management space. The Water Drinks events hosted by Clearwater and Stormwater Victoria are an opportunity for practitioners to meet other people working in the industry and to share ideas, experience and perspectives on key issues in an informal environment. Community consultation and communication approaches that can assist organisations in IWM planning, by Christy Arnott from ASDF research (previously Social Research Officer at Moonee Valley City Council) - Shared research results of a community consultation project and tips for success, such as the importance of understanding knowledge gaps, beliefs and values so that this information can be used to better develop programs and communications to change attitudes and behaviours. “Two key areas of focus for community engagement are raising awareness of benefits and addressing negative perceptions". Engaging with communities about water sensitive futures, by Briony Rogers from CRC for Water Sensitive Cities - A reflection on research undertaken to understand community values, priorities and aspirations; community members valued the opportunity to be part of long-term planning discussions. "The water industry is recognising it has a role to play in empowering community as active water stewards". Presentations are available upon request. If you would like a copy, please contact the Clearwater team on 03 9679 7711 or email info@clearwatervic.com.au. The next Water Drinks will be held in late May at Hophaus Bar in Southbank. We hope to see you there.